Internet & Mobile World conference invited Strands CEO Erik Brieva to join key industry leaders and speak about how machine learning is disrupting the banking industry. Known as the largest B2B expo-conference for IT & digital solutions in Central & Eastern Europe, the event focus on the principal challenges and ways to overcome obstacles facing the industry. Erik shared best practices and advice about machine learning during the Day 2 morning session from 10:30 -11:00am. The session was organized by Raiffeisen Bank that initiated the contact with Erik. Today, machine learning has come to play an integral role in many areas of the financial ecosystem, from approving loans, to managing assets, to assessing risks. However, few professionals have an accurate view on how it could help them grow their business. Erik helped the audience understand and leverage the correlations within the large pool of digital breadcrumbs that financial leaders have at their disposal. Machine learning has become one of the buzzwords, but how can you actually translate key concepts and apply it to your business? Erik introduced a range of best practices and recommendations based on more than 450 Strands implementations in banks. Read more about the Internet & Mobile World Conference here, or follow @IMWorldEvent on Twitter! The aim of this prestigious event is to promote the exchange of experiences and knowledge on the topic “24/7 customer service: presence anywhere, anytime​”, as well as to create opportunities for future collaboration among participants. The 22nd meeting is aimed at GRULAC WSBI institutions, in addition to financial players, officials of central banks, supervisory authorities, other multilateral agencies related to the issue in the region, and experts from the institutional, cooperation and business sectors. In the final panel session on Day 1, Albert will be joined by officials from the Association of Banking Supervisors of The Americas (ASBA), Ipsos, CaixaBank and CecaBank to discuss the how banks can achieve channel omnipresence, seamless service quality and matchless customer experience. The full agenda for the 2-day event can be viewed here. Check out the biographies of Albert’s fellow panelists here. For more general information on the 22nd WSBI GRULAC meeting, see the event website or contact Aimee Suarez at aimee.suarez@wsbi-esbg.org​​. 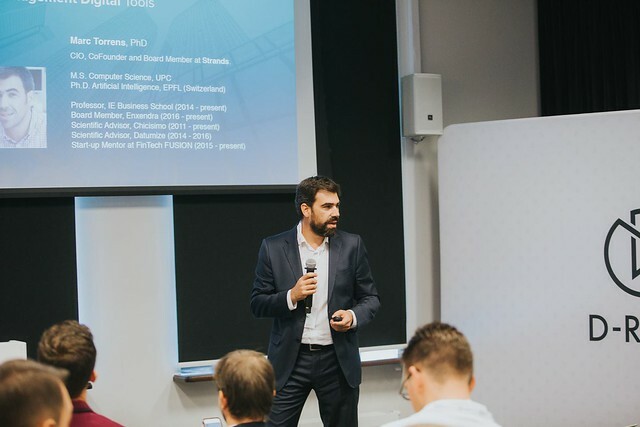 On 22 September, Strands joined some of the most innovative scaling startups in Europe to demo at the D-RAFT Demo Day in Warsaw. D-RAFT Corporate Demo Days are designed to connect best ready-to-scale, late stage startups in one area with corporations that want to buy, partner or invest in disruptive solutions. Strands was selected among 10 innovative startups to receive the opportunity to present their solutions (including AI & digital disruption, big data & machine learning, human to technology, exponential technologies) in an 8-minute Finovate-style pitch to corporate executives and participate in individual matching sessions with our partners, including MasterCard, HPE, Microsoft, EY and more. Learn more about the D-RAFT Corporate Demo Day: AI & Robotics here. D-RAFT is fully dedicated to supporting big companies in finding ready-to-scale startups and turning their technologies and products into new businesses. They have spent the last decade helping corporations innovate and are now connecting ready-to-scale startups with resources and relations of leading regional and multinational corporations. Finovate Fall was a smashing success for Strands. We took the spotlight on Day 2 to demo Strands BFM – the the end-to-end white-label solution designed specifically for SME banking. Learn more about Strands BFM here. Leading the charge of Strands Finovaters was VP Sales and Operations Cesar Richardson, who was interviewed by Mondato at the event: “To me, banks are going to shift away from being transactional entities to repositories. Banks do not currently have a culture around monetizing data, which is where they will have to inevitably go if they want to remain profitable. To be able to collect that data, you need to have clients spend time on your channel.” Read the rest of Cesar’s interview here. Also representing Strands was Directer of Sales (North America) Sharif Penniman. The 2016 Global SME Finance Forum will bring together leaders from banks, fintech companies and development finance institutions. Taking place in Beijing, China from September 19-21, this year’s conference will explore new opportunities and innovation in small business finance. The Forum will also convene the world’s leading experts to examine issues and share best practice examples ranging from SME finance regulation, financing women entrepreneurs to the impacts of blockchain technology and artificial intelligence impact on the financial sector. During these FinTech sessions, participants will explore technology solutions designed to overcome business banking challenges, expand financial services offered to small business customers, or to streamline existing services. In this panel, Strands General Manager Pau Velando will be joined by other FinTech experts from Digivation, FernSoftware, SizeUp and IDMission to talk about how FinTech can innovate non-financial services for SMEs. Artificial intelligence has risen to prominence once again as a new frontier. In this high-level panel, Strands General Manager Pau Velando will be joined by experts from the IFC, IBM and another FinTech (IceKredit) to discuss the reality – rather than the hype – of how artificial intelligence and machine learning is poised to change SME finance. Sales Director (APAC) Xavier Marcillac will share Strands’ latest innovations making business financial management effortless & efficient for SME banking customers. Learn more about the SME Finance Forum here. You can find photos and takeaways of Strands at last year’s event here. To follow the event on Twitter, check out #SMEFinance2016.